Looks like a giant piece of crochet in pebbles. If you’re interested in historic places, you can read about Raglan over at my history blog, Mists of Time. Jo, according to the guidebook, the cobbling is modern – the castle has had a lot of work over the years – I’d still love to know who actually did it, it seems perfect for the building and must have been the work of someone who really tuned in to the ruins. Ah well, it was a nice idea! As you say, it’s a very nice addition that is in keeping with the building! Exactly! a giant stone crochet. Beautiful! Whoever did it should be proud (and get a mention in the guidebook). 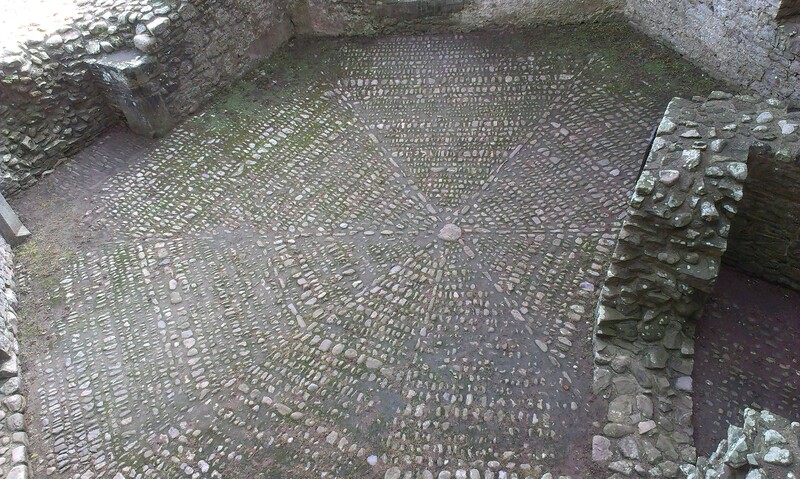 Someone with an artistic streak laid that floor – it is as you say like a giant piece of crotchet – There is a girl in Scotland who lays pebbles in concrete in flower designs they are quite stunning and gave me an idea for our cottage garden as we have heaps of pebbles. I will see if I kept the leaflet from her exhibition.